Horticultural therapy is a time-proven practice. The therapeutic benefits of garden environments have been documented since ancient times. In the 19th century, Dr. Benjamin Rush, a signer of the Declaration of Independence and recognized as the "Father of American Psychiatry," was first to document the positive effect working in the garden had on individuals with mental illness. In the 1940s and 1950s, rehabilitative care of hospitalized war veterans significantly expanded acceptance of the practice. No longer limited to treating mental illness, horticultural therapy practice gained in credibility and was embraced for a much wider range of diagnoses and therapeutic options. Today, horticultural therapy is accepted as a beneficial and effective therapeutic modality. It is widely used within a broad range of rehabilitative, vocational, and community settings. Horticultural therapy techniques are employed to assist participants to learn new skills or regain those that are lost. Horticultural therapy helps improve memory, cognitive abilities, task initiation, language skills, and socialization. In physical rehabilitation, horticultural therapy can help strengthen muscles and improve coordination, balance, and endurance. In vocational horticultural therapy settings, people learn to work independently, problem solve, and follow directions. Horticultural therapists are professionals with specific education, training, and credentials in the use of horticultural for therapy and rehabilitation. Read the formal definition of the role of horticultural therapists. In recent years we have seen a significant upswing of interest in therapeutic gardens. These gardens are specifically designed to address a variety of applications within healthcare, rehabilitative and other therapeutic settings. 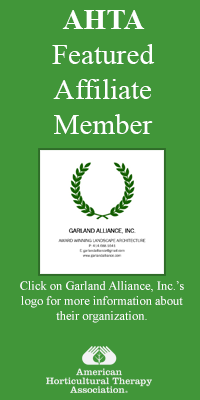 In fact, the American Society of Landscape Architects maintains a professional practice network of consultants who specialize in designing therapeutic gardens. A therapeutic garden is a plant-dominated environment purposefully designed to facilitate interaction with the healing elements of nature. Interactions can be passive or active depending on the garden design and users’ needs. There are many sub-types of therapeutic gardens including healing gardens, enabling gardens, rehabilitation gardens, and restorative gardens. What makes a garden therapeutic? The basic features of a therapeutic garden can include wide and gently graded accessible entrances and paths, raised planting beds and containers, and a sensory-oriented plant selection focused on color, texture, and fragrance. Learn more by reading AHTA's characteristics of therapeutic gardens. Frequently, landscape designers collaborate with horticultural therapists to create beautiful spaces that accommodate people with a wide range of abilities. While these gardens may represent the ideal, successful horticultural therapy programs do not depend upon an elaborate garden design. Likewise, a professionally-designed therapeutic garden without a horticultural therapy program is unlikely to deliver to its full potential. American Society of Landscape Architects; Healthcare and Therapeutic Design Professional Practice Network. Therapeutic Landscapes Network, A resource for gardens and landscapes that promote health and well-being. TherapeuticGarden Characteristics By Teresia Hazen, MED, HTR, QMHP. 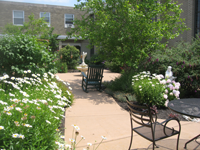 The Sensory Garden at St. John Neumann Nursing Home, Philadelphia, PA Design for Generations LLC. Rochester General Hospital Strolling Gardens, Rochester, NY, Zaretsky and Associates. 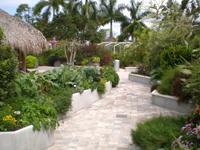 Buehler Family Foundation Enabling Garden at Naples Botanical Garden, FL.